You know it's true that the youth is the future leaders of our countries. So as young or as early as now, we should be conscious of the way we think; like the views we have now towards issues, whatever they may be. Because the way we look at these says much about how we will be directing our lives the next couple of years. And while, we have to admit, not everyone is built to take big steps, there are still different ways we can engage in activities that can help create change. 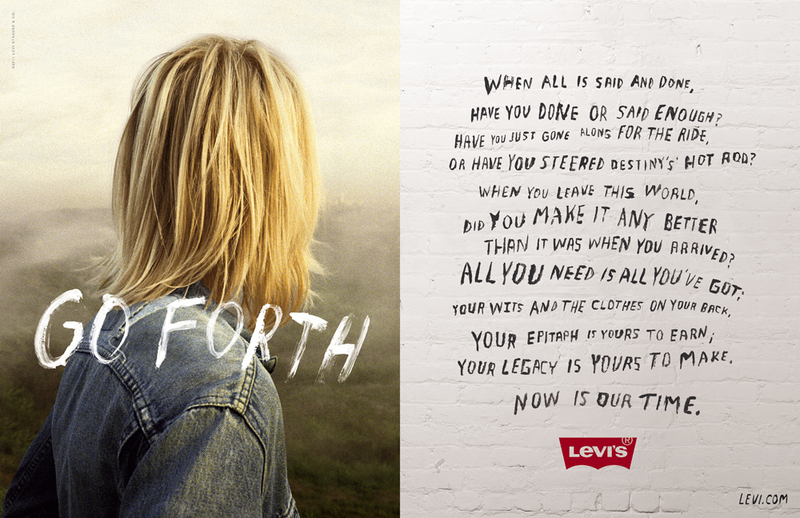 This year, Levi's is pushing forward a campaign that encourages the youth to take the wheel and make their own legacy. Go Forth asks the question, "When all is said and done, have you done or said enough?" --a simple question, yet catchy and powerful. Have you done or said enough? It seeks for passion and positive change. 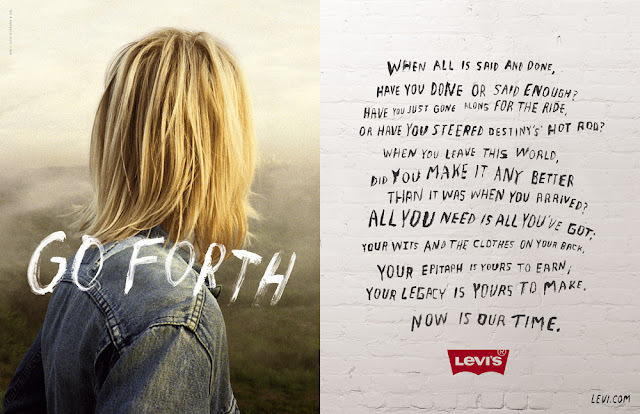 Levi's® Philippines recently tapped into the market of local Twitter users and held an online contest in line with the Go Forth campaign. 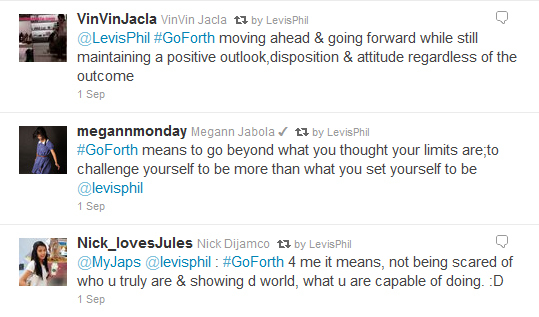 They tweeted the question, "What does #GoForth mean to you?" Three best statements were to win Levi's® gift certificates. I thought about it, tried my luck, and literally went "Oh my gosh! Seriously?!" as my eyes opened wider seeing that my tweet was retweeted by @LevisPhil along with two other chosen statements. I could not believe it! I was so happy! At the time, I honestly had no idea what the campaign really was. But I've been following them on Twitter because I have a friend who had her internship there and I was quite curious about them. I never thought my curiosity could lead to something as great as this. But this blessing has led me to researching more about the campaign. Levi's is looking for pioneers--pioneer is someone who is "creative, courageous, selfless individuals who are helping to make the world a better place." It's very inspiring! And if you'd like to know more about the campaign, or if you know a pioneer, check out their website! I encourage everyone to ask yourself the same question... have you done or said enough? And while you're at it, follow Levi's® Philippines on Twitter.